Last week we left you in suspense as to whether Alan’s failed campervan would get to Preston before midnight last Tuesday after its breakdown on the A66 at Stainmore early afternoon. We can now report that the AA finally delivered Alan and his campervan to the RSR at 00. 45 Wednesday morning. Needless to say that, after an 02.00 arrival at his bed, Alan wasn’t back with us at Preston until rather later on that day. 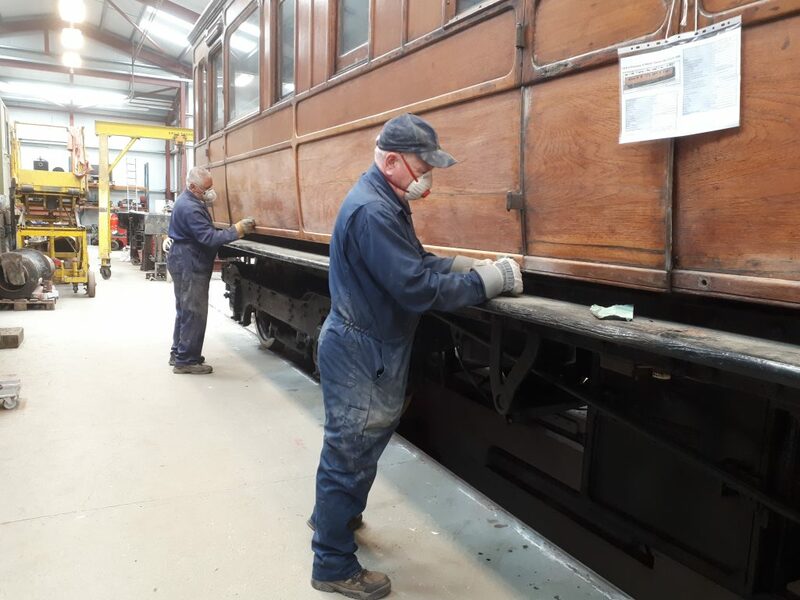 Meanwhile, Tim, Paul Newton and John Davis continued the job of sanding down Great Eastern Railway Royal Saloon No. 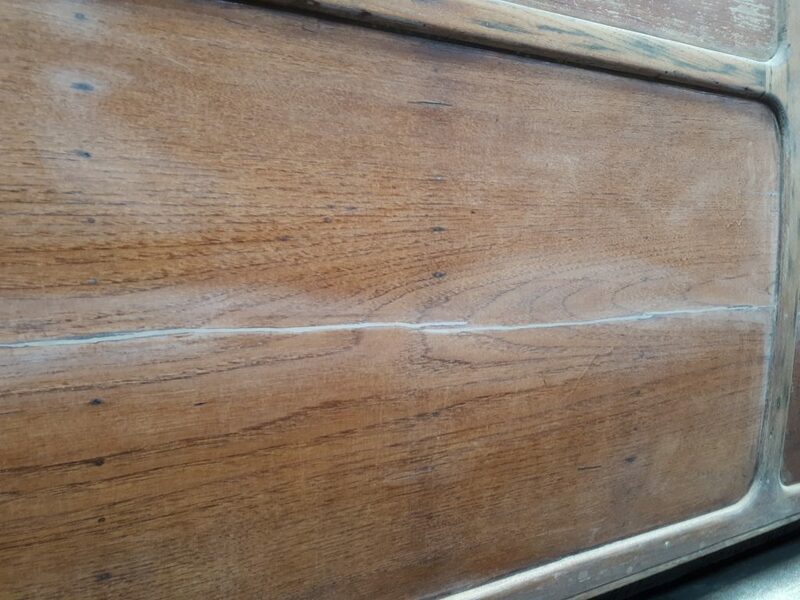 5 whilst John Dixon filled and sanded down the various cracks in the teak panels. The job continued on Friday when Fred and Roger joined Paul and the two Johns, with the task now well on the way to completion. That’s just as well for the work really does take it toll, numbing both fingers and mind! Howard and Adrian continued their efforts to remove Caliban‘s springs – three on the ground are pictured here last Wednesday. Adrian put in a little more time on both Thursday and Friday (he must be getting better!) and the fourth spring was off by the time that he retired from the fray. Ade is back to work this week, we hear. We forgot last week to congratulate Keith on his retirement from his job with Ribble Rail on the 4th May. 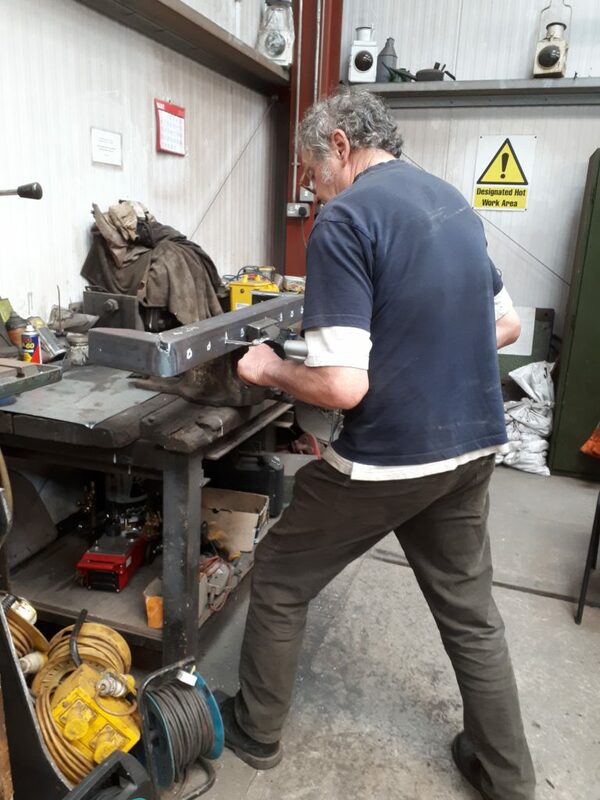 Needless to say, Keith is making the most of his new found leisure time to progress the tender frames for Wootton Hall. He is seen here drilling a brace section that will support the vacuum cylinder. 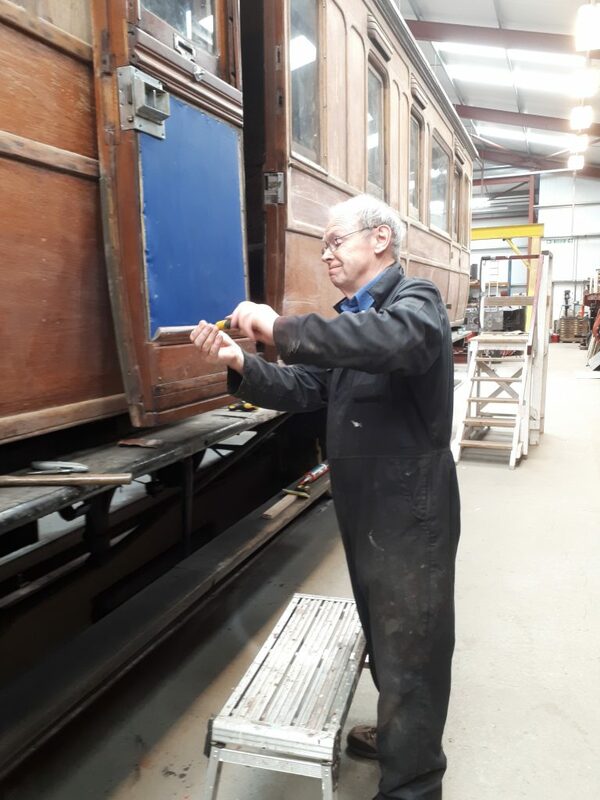 This next Wednesday should see some work to examine one of FR 20’s tender axleboxes which was found to be warming up during its final steamings at Locomotion. Some attention to the brass bearing looks likely in order to solve the problem. Finally this week, the FRT’s ‘Austerity’ 0-6-0ST Cumbria has been taken out of traffic at Embsay and washed out in readiness for it cold inspection by the boiler surveyor today. If all goes well, there will be a formal steam test early next week.